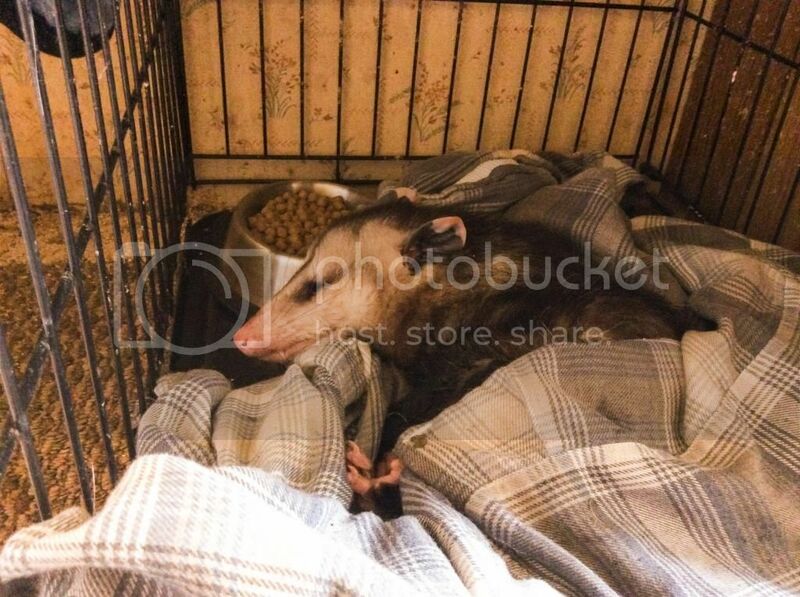 My friend, the one that was raising the babies, has caught the opossum we saw earlier just to check overall health, assuming it is Ozzy. She did notice a small wound on the tail, and placed Neosporin on it to help it heal. I told her that they're exceptionally hardy and often survive wounds that would be fatal to us, but she wanted to help him anyways. She told me she's confident it's him. Young male, still has white tipped ears, same shade of dark smoky grey coat, identical markings, size of a juvenile cat, ears are in good condition, just one small cut, tail is in good condition aside from the wound. Good muscle strength in 'hands' and tail, docile temperament, no growling, hissing, etc. I don't personally condone trapping after release only to be released again.. I think it puts stress on an animal... but it would be nice to have some closure. What do you all think? She sent me this pic earlier today. Ozzy would be roughly 5 months old by now. She says he believes he may of gotten in a scuff with the local feral cats there. Upon closer inspection he has wounds on his nose and neck as well. Aaw, he's cute. 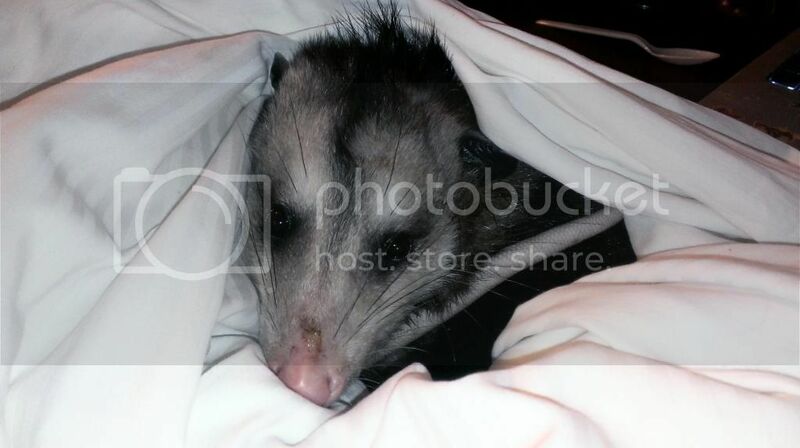 It definitely could be him if there aren't usually other opossums in the area. What are your thoughts? Are you planning to keep him? While she may be in the boonies, as we say, she's not alone. The reason the wildlife population has dwindled to practically nothing is because the other locals have been illegally shooting them. There used to be a whole herd of deer that grazed at night, but they haven't been sighting since March. Not a one. If he's willing, I don't see any reason not to keep him as long as you are willing to give him the best care you can and not just lock him in a small cage and feed him. He's just about lived his lifespan in the wild so no reason not to give him another try. Well I visited today and the best I got was him sleeping beside me. He wouldn't take food from me, but would eventually sniff it over. He did allow me to pick him up and pet him. Sometimes he ever so slightly opens his mouth and drools a little, but not full on threat display, even when being approached or picked up. I took a little video. What do you all think? 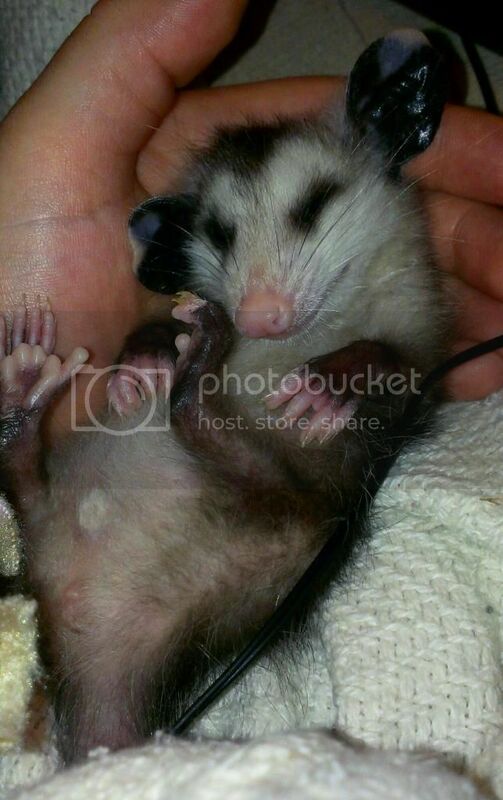 Would a wild raised opossum allow this? I'm just trying to make sure it is him.